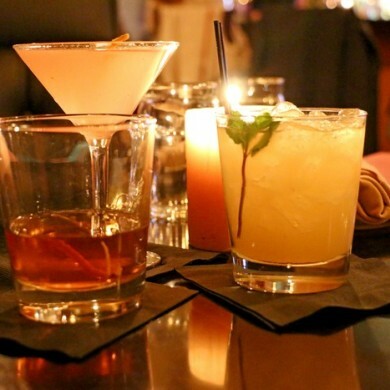 If you’re seeking the best drink menu on the mountain in an atmosphere that will transport you to a time when drinks like these were best consumed in secret, head to the modern-day speakeasy known as On the Rocs. In addition to the spectacular sipping selection, it’s also one of our top places to eat in Killington. It’s an upscale apres-ski experience. Knowledgeable bartenders are true artists of the craft, mixing homemade ingredients into creative cocktails. The staff is friendly and attentive, and the menu sets itself apart, while offering surprisingly affordable prices. It’s a throwback to prohibition, with a machine gun hanging over the fireplace and mug shots of the likes of “Lucky Luciano” on the walls. But the music brings you back to the present, with a fun, current soundtrack playing low in the background. The bar is low-key and intimate, the atmosphere warm and candlelit. Try the best Moscow Mule on the mountain, handcrafted with homemade ginger beer. We also loved the Brussels Sprouts and the Scallops with Cauliflower Puree. Killington has a culinary diversity that allows for a new and fun experience in each visit – casual and quick or relaxing and refined. On the Rocs is unlike any other option on the mountain. Its classic, speakeasy vibe allows guests to relax and navigate an experience that suits their mood. Enjoy handcrafted cocktails and tapas by the fire. Try fish tacos and a beer at the bar. Whether solo, with your partner, friends, family or your company ski retreat, On the Rocs offers quality food and drinks. Can’t-miss menu items include the Crispy Brussels Sprouts with Garlic and Soy, Roasted Rack of Lamb with Dijon herb crust, crispy parmesan potatoes and vegetable du jour, and the Grilled Marinated Pork Chop, a bone-in 12 oz. chop with risotto bolognese, aged parmesan, baby arugula and pickled onions. On the Rocs is located at 2384 Killington Road in Killington, VT. For more information, visit the On the Rocs website or call (802) 422-7627.